I met a baby today and am delighted by babies generally, which means I have babies ON. THE. BRAIN. this evening (hello to any and all future boyfriends!!!) So it is with the greatest pleasure that I present to you the **VERY OFFICIAL** photos from Prince Louis’s christening, which were released by Kensington Palace this weekend. 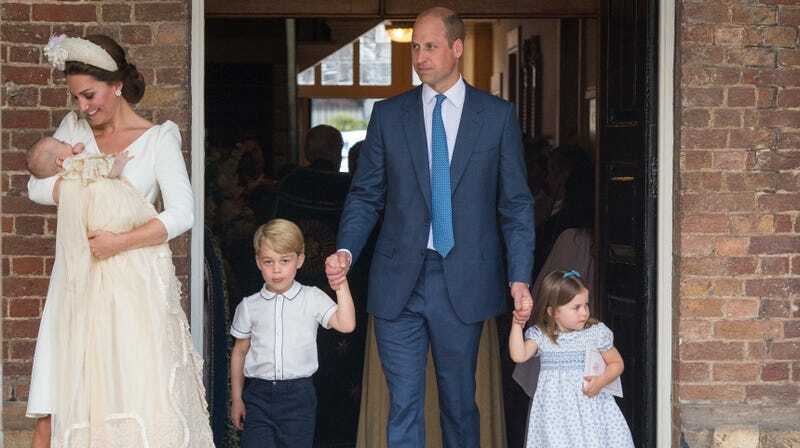 That last photo has reportedly caused a small scandal amid royal experts, who noticed Harry and Meghan are linking arms. Apparently, it is uncommon for royals to touch each other, though as People explains, “There is no protocol that says they can not show affection on official engagements, and this gesture makes them relatable and lovable to the public.” Indeed, according to People, arm-linking is Harry and Meghan’s “signature move,” just as my signature move is eating pizza alone in my apartment and looking at pictures of other people’s babies.